Pins lay flat for machine sewing. 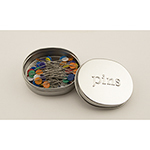 Extralong and sharp pins come in assorted colors. 2" long, .60mm diameter. Head is not heatresistant. Do not apply iron directly.